According to the flood of emails that have hit our inbox, the soak test of Jelly Bean (Android 4.1.2) for the original DROID RAZR and RAZR MAXX has officially begun. We don’t exactly know when it’ll arrive for all users who are not a part of the Motorola Feedback Network, but assuming this test goes smoothly, it shouldn’t be long. And for your sake, I hope you aren’t waiting more than a week, as the update rids the device of almost all Moto-inspired bloatware, turning it into a device that even an Android elitist snob would be proud of. If this update isn’t a sign of the “new” Motorola, then I don’t know what is. Below, you’ll find the full changelog for the update. The “enhancements” and “fixes” sections are filled with typical goodies and all, but the “changes” section is what should really get you going. Motorola has decided to remove the Social Location app, MotoActv, MotoPrint, Alarm and Timer (replaced by stock Google Clock), and Verizon Video on Demand. They also killed off the My Gallery and My Music apps in favor of the stock Android Gallery app and Google Music. MotoCast is no longer integrated into anything on the device, including the Files app. It’s now a stand alone app (it has been enhanced to be much more powerful). They also killed all of sorts of widgets that you likely weren’t using anyway, as they were tied to many of these now-deceased apps. Outside of the debloating, they made Chrome the stock browser, brought in Google Now, enhanced Voice Search, improved the camera greatly (better panorama too), improved network connectivity, fixed contact sync, and sooooo much more. The build number is 98.72.16. This is quite the update. 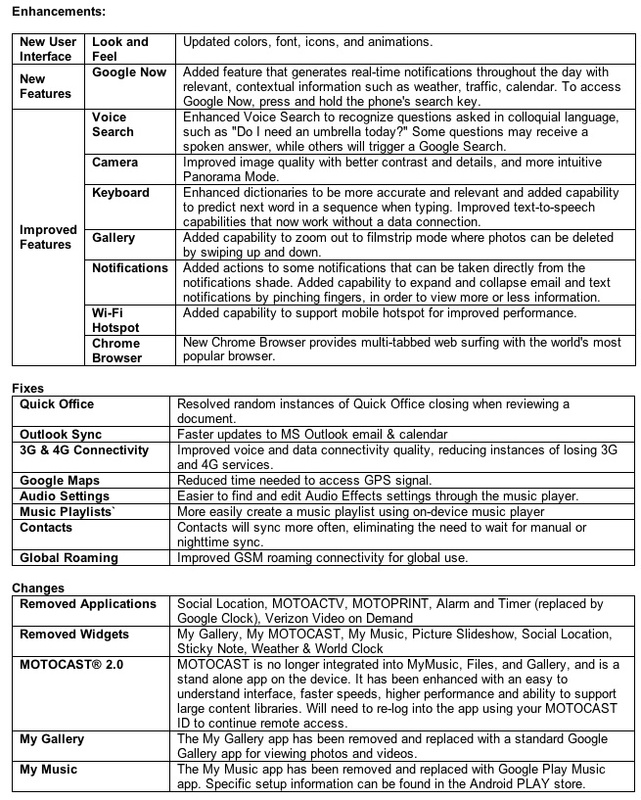 It may shock some of you to see so many major changes, but this is the direction Motorola wants to go. Less “Moto” branded software, more stock Android. We can’t argue against that. 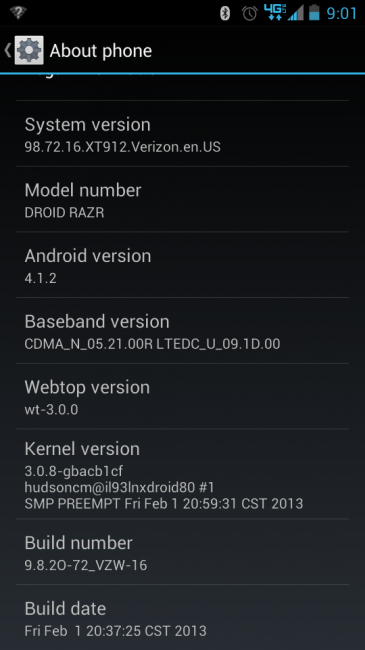 Update: Here is the update file and instructions for those running the X-mas Jelly Bean build. Cheers Justtyn, S, P, C, M, D, Z and so many more of you!